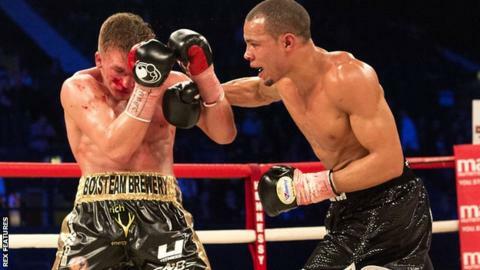 Former boxer Michael Watson "went down memory lane" after watching Chris Eubank Jr's British middleweight title victory over Nick Blackwell. The referee stopped the fight in round 10 on the advice of the doctor and 25-year-old Blackwell remained in an induced coma on Sunday night. Watson suffered brain damage in 1991 after a fight with Chris Eubank Sr.
"It was a real sense of deja vu as the story unfolded. I went down memory lane in many senses," said Watson. On Monday, Blackwell's family released a statement thanking the public for their messages of support, but gave no update on the boxer's condition. The British Board of Boxing Control said it is satisfied with referee Victor Loughlin's handling of Saturday's bout. At the end of the eighth round, Eubank Sr told his son to aim his shots at Blackwell's body rather than his head. It is unclear whether his instructions were tactical or designed to protect the defending champion from further harm. "If the referee doesn't stop it, then I don't know what to tell you," Eubank Sr told his son. "But I will tell you this: if he doesn't stop it and you keep on beating him like this, one, he is getting hurt, two, if it goes to a decision, why hasn't the referee stopped the fight? I don't get why. "So maybe you shouldn't leave it to the referee. But you are not going to take him out to the face. You are going to take him out to the body. OK?" Two rounds later, Blackwell was deemed unable to continue because of swelling over his left eye and was later taken from the ring on a stretcher. He suffered a bleed to the brain but surgeons were not planning to operate on him. Watson, 51, was critically injured in a WBO super-middleweight title fight against Eubank Sr in September 1991. There was no ambulance or doctor at that fight and it was several minutes before Watson received any treatment. He spent 40 days in a coma and had six brain operations, leaving him with irreparable brain damage and partially paralysed. "Chris and Nick were involved in a very tough fight, and it was a very sad thing to see Nick hurt at the end and then to hear what has happened to him after the fight," Watson told the Telegraph. "We, as boxers, step into the ring knowing there are risks. But it is the same for a racing car driver, the same for any other sport which involves hard contact. It is one of those things that can happen in sport and life. "I went through a lot when it happened to me and it makes me feel happy that what I went through led to a change in the medical provision laid out for boxers. "Young Chris need not blame himself for what has happened. It was not his intention to bring harm to his opponent, as strange as that sounds. It was an accident. "I have been praying for Nick and his family, and for them to have great strength. It is a very tough time for them. It was for my family. I truly hope that everything works out for him."